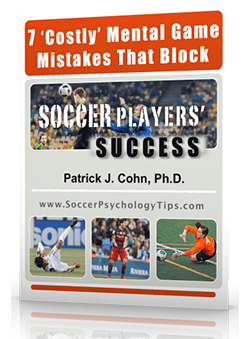 What barrier are YOU trying to overcome in soccer? Do you have any comfort zones? Maybe your goal is to get some playing time… or break into the starting line-up… or make a traveling or collegiate soccer team? Sometimes soccer players never achieve the breakthrough they were looking for. For these soccer players, the feeling is they have not seen the fruits of their labor… These soccer players feel like they have failed or, more likely feel like they are failures. Some players simply don’t put in the required amount of work. 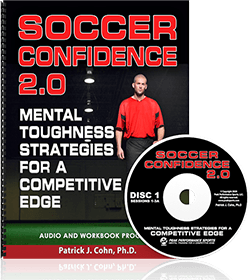 Some soccer players don’t have the confidence in their ability to achieve greater success. Some players give up too soon when adversity hits. 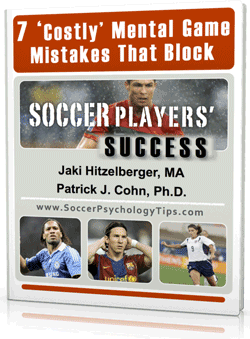 Some soccer players are overwhelmed by pressure when they get their opportunity. Achieving a breakthrough takes hard work, patience, more hard work, and the ability to perform under pressure. Breaking through to a new level requires a certain persistent mindset that won’t allow a person or an obstacle hold them back from achieving their goal. Realistically, there will be times where you feel beaten down and may question your abilities but those doubts are fleeting and you tell yourself to get back on the field one more time… then one more time… then one more time! Success is not like a fast food restaurant where you pay your money and immediately get your food. Success is more like hunting in the wild… you have to make you own spear, wait patiently for your prey, prepare your food, then cook it before you partake in your dinner. San Jose Earthquakes goalkeeper David Bingham knows exactly how difficult it can be to achieve a breakthrough. Bingham was drafted in 2011 and played in only five games in his first four seasons. Nonetheless, Bingham kept working hard for his opportunity and it came in 2015 when he was named starting goalkeeper for the Earthquakes. Not only did Bingham get a chance, he made the most of his opportunity. As a full-time starter in 2015 and playing in every single regular-season minute, Bingham tied San Jose’s single-season record with 12 shutouts. Bingham even earned his first full-team cap with the USMNT in 2016, shutting out Canada 1-0. The keys for Bingham’s breakthrough were patience and focusing on the work he needed to do in the moment to best prepare himself for his opportunity. Like Bingham, to achieve your breakthrough, you must have a view of the “big picture” but stay focused on the little details in each moment so you are mentally prepared for your big break. What three things do I need to do to achieve my big picture goal? How can I work on these 3 things today? (At the end of the day) How well did I focus on these things? If you can successfully focus on the details each day, you will be prepared to make that breakthrough happen.